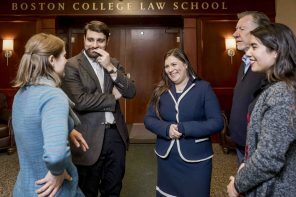 Now in its fourth year at BC Law, the Rappaport Center is making more than a difference—it's shaping tomorrow's policy leaders. The event was like so many BC Law’s Rappaport Center has presented, bristling with ideas and stimulating conversation. A forum of passionate, well-informed civic stakeholders had gathered, intent on making their community better—in this instance, by tickling out ways to reform criminal justice in Massachusetts. It was February 21, 2017, and among those in the audience was attorney Richard Cole, chair of the Massachusetts Bar Association’s Civil Rights and Social Justice Section Council. 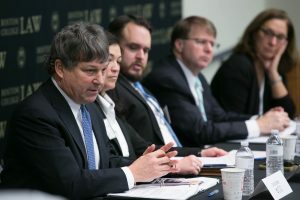 For some time, Cole and other MBA colleagues like Kevin Curtin ’88 had been discussing criminal justice reform, and in October 2016 they formed the MBA’s Criminal Justice Reform Working Group to propose specific, concrete proposals to help address some of the key challenges in the criminal justice system, including conviction integrity. Cole arrived at Boston College Law School that day eager to learn more about emerging criminal justice reform ideas. Of particular interest to him was the session on best practices to identify and rectify wrongful conviction and miscarriages of justice. Among the panelists was BC Law professor and director of the school’s Innocence Program, Sharon Beckman, an attorney from the Dallas District Attorney’s office, and a judge from the North Carolina Supreme Court, all of whom had experience with conviction integrity efforts that could possibly serve as models for Massachusetts. What a timely panel, Cole thought. He had little idea at the time just where it might lead him. As envisioned by Phyllis and Jerome Lyle Rappaport and supported by the foundation that bears their name, the Boston College Law School Rappaport Center for Law and Public Policy is a locus of public policy reflection and activity, hosting a distinguished public policy series of events, influential lecturers, and visiting professors, and supporting a fellowship program that mentors students in public policy and interns them to government agencies and civic entities. 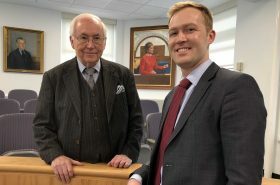 This past September, the center began its fourth year at BC Law by welcoming Professor Daniel Kanstroom as its new Faculty Director and retired Supreme Judicial Court Justice Robert Cordy and Connecticut Governor Dannel Malloy ’80 as the 2018-2019 academic year’s Distinguished Visiting Professors (fall and spring, respectively). Under the leadership of inaugural Faculty Director R. Michael Cassidy and Executive Director Elisabeth J. Medvedow, the mandate of Phyllis and Jerome Rappaport to improve understanding of public policy issues has been animated by the challenging ideas, perspectives, and analyses brought to BC Law by the center’s leadership and participants. 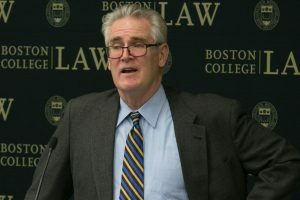 The center’s ability to attract top policy influencers early in its years at the Law School is due to several key factors: the Rappaport name, Cassidy’s deep roots in the legal and public service community, and Medvedow’s capabilities as a well-connected and indefatigable networker and administrator. Together, they advanced a robust mix of scholarship, experiential learning, and community engagement. According to Cassidy, the Rappaport Center has reenergized the Law School’s deep and longstanding commitment to preparing students for a lifetime of leadership in public service. “Our former dean, Robert Drinan, SJ, was fond of saying that ‘lawyers are the architects of a just society.’ The Rappaport Center allows us to expose our students daily to the pivotal role lawyers in all subject areas play in shaping public policy, both regionally and nationally,” Cassidy said. 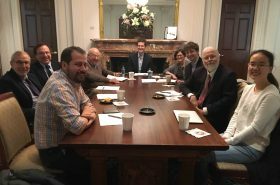 “The Rappaport Center’s reputation enables us to secure panelists and speakers who are experts in their field, incredibly smart and articulate, and who present practical insights and approaches to solving complicated, and at times, intractable societal issues,” said Medvedow. The numbers tell much of the story. 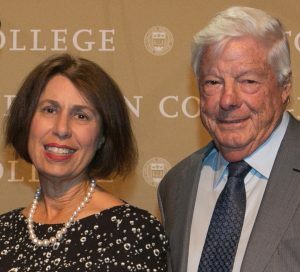 In its first three years at BC Law, the Rappaport Center presented 50 lectures, symposia, and conferences and hosted 30 A-list speakers, among them 3 current or former governors, 2 former lieutenant governors, 3 US legislators, 3 attorneys general, 3 cabinet secretaries, 2 state supreme court justices, and 5 mayors. And that’s not counting the prominent academic, civic, business, and nonprofit leaders, and state and local officials who have given new meaning and urgency to the role of public policy in the life of the Commonwealth. National and local voices heard in the past three years include those of former presidential candidate and Maryland governor Martin O’Malley, US Ambassador and Iran negotiator Wendy Sherman, former US Solicitor General Donald Verrilli Jr., US Attorney for Massachusetts Carmen Ortiz, Massachusetts Supreme Judicial Court Chief Justice Ralph Gants, Congresswoman Katherine Clark, Middlesex District Attorney Marian Ryan, Boston City Councilor Michelle Wu, Newton Mayor Setti Warren, AG Maura Healey—the list goes on. Similarly, the parade of topics discussed has been wide ranging: student debt, women in politics, criminal justice reform, public health, constitutional democracy, immigration enforcement, gun control, wealth inequality, and free speech, to name a few. One of the largest beneficiaries of this outpouring has been the student body. 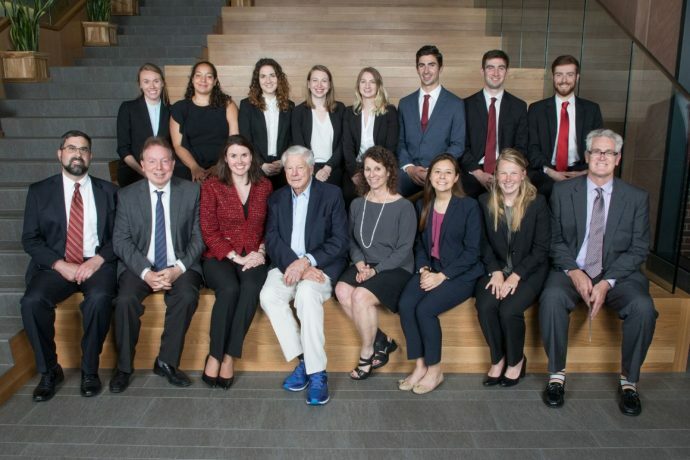 Attending events, interacting in classrooms with Rappaport’s professors and lecturers, and competing for the coveted summer Rappaport Fellowships, students have become attuned to public policy as a viable and rewarding legal career. 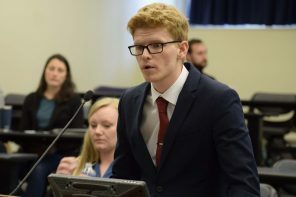 “There is only so much a law school casebook can teach you about innovation and problem-solving,” said James Bor-Zale ’17, a 2015 summer Rappaport fellow who began clerking at the Massachusetts Supreme Judicial Court after graduation. “That summer, I found out quickly that a law school fact pattern is no substitute for experiential learning. A meaningful moment was touring Codman Academy, a high school located within a community health center. It was eye-opening learning how school and community leaders were leveraging wellness and nutrition as a way to achieve student success,” Bor explained. Add to them the mentors at state and local agencies where fellows are placed, the centers’ directors and advisors, and the Rappaport event participants, and it’s not hard to see why the program has reached a level of breadth and integration that pleases Jerome Rappaport. 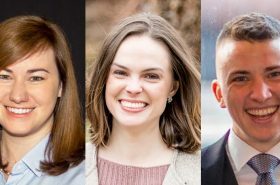 “The community reflects a unique network that demonstrates that the fellows program has impacted people, more frequently than not, to go into public service at the state and local level. I love to see this mature,” he said. Indeed, one student called the Rappaport Fellowship the highlight of his law school education. Another, Lauren Koster ’19, who interned with the Office of the General Counsel for the Massachusetts Department of Elementary and Secondary Education, worked on finalizing drafts of new regulations. A school teacher and education policy advocate before attending law school, she was still surprised by how law can be shaped by the input of not only lawyers but also a host of other stakeholders, including public commenters. Koster came to understand that law and policy can and should be one and the same. “The law is stronger and more just when policy leads its creation,” she said. After a clerkship upon graduation, she hopes to work in a legal aid organization or state agency on policy issues affecting the whole child through education, juvenile justice, and child welfare. 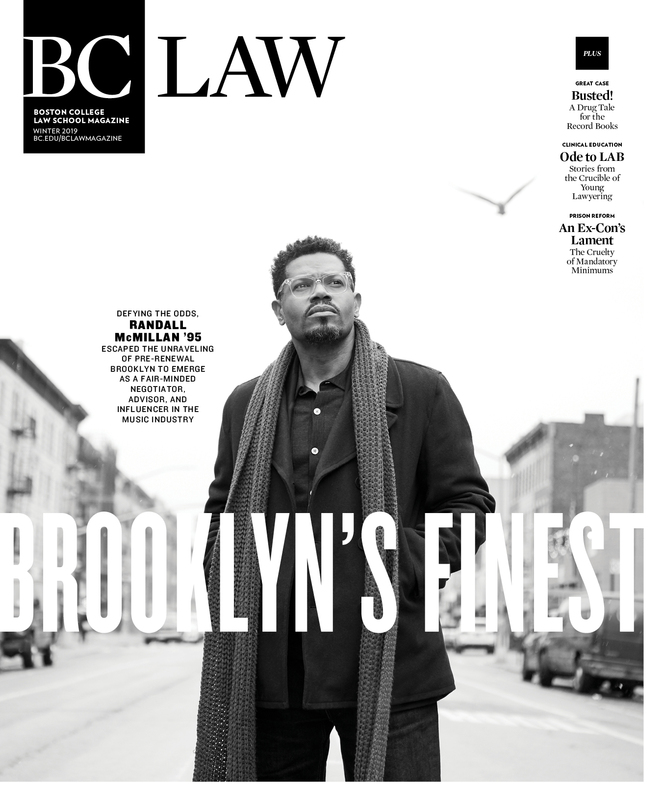 That is exactly what Professor Cassidy imagined when he was appointed to a three-year term as the center’s first faculty director after it moved to BC Law from Suffolk University at the beginning of the 2015-2016 academic year. 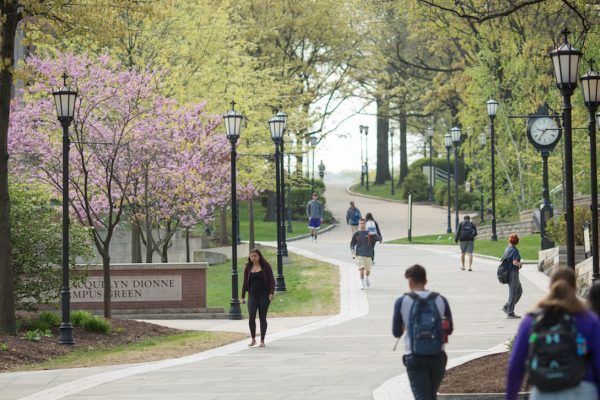 Kanstroom, the new faculty director, believes that a factor in the Rappaport Center’s many successes is its alignment with Boston College’s commitments to good government, public service, human rights, and ethics along with the University’s appreciation for interdisciplinary study. Faculty throughout the university—among them professors of social work, political science, and education—are excited by and participating in Rappaport programming. The doors are wide open to more collaborations. Further, Kanstroom has recently announced that the center is expanding the research component of its fellowship program. Current and future fellows will undertake deep, impactful research on legal and policy issues. Published work may be disseminated as briefings or “white papers” by the Rappaport Center. In extraordinary cases, they may also be published in law reviews or other academic sites. 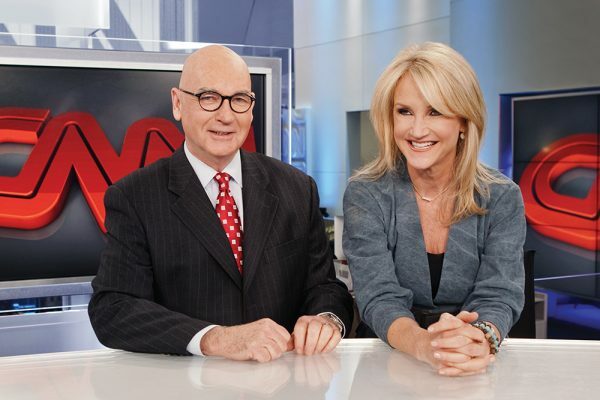 The Rappaports like what they are seeing as the center enters its fourth year on the cutting edge of public policy debate. “Promoting emerging leaders is our logo. We like the idea of talent energizing other talents,” said Phyllis Rappaport. Clearly, Rappaport’s impact continues to grow. Remember Richard Cole from the Mass Bar Association, who participated in the Rappaport conference on criminal justice reform? Photograph at top, front row, l-r: Dan Ordorica, Daniel Kanstroom, Laura Koster, Jerome Rappaport, Elisabeth Medvedow, Robyn Casper, Meg Ziegler, Michael Cassidy. Back row, l-r: Jennifer Peterson, Siri Nelson, Anna Madrishin, Cloe Pippin, Kayla Venckaukas, Michael Anderson, Garrett Casey, Sam Burgess.